Snow and wind again today. It reminds me that there was a time when I anticipated the first snow, the one that occurs in the mountains, that can be viewed from a distance, that still looks beautiful. 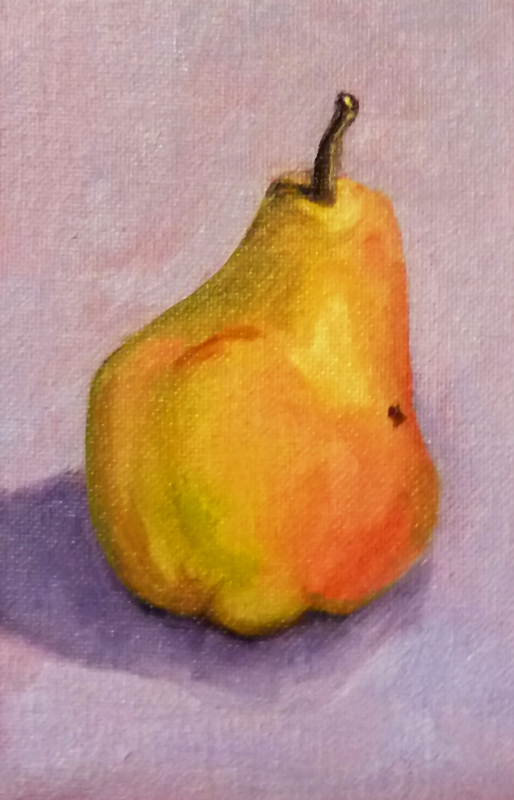 My thoughts resulted in this little 5x7 inch oil painting. It can be viewed or purchased from my Etsy Shop by clicking on this link. The sky spit snow today. When it was finished, the sun came out and smiled through the window into my studio. It inspired me to think of sweet things and warm ideas. This little painting of tangerines resulted. It is 6x6 inches and can be purchased or viewed here. 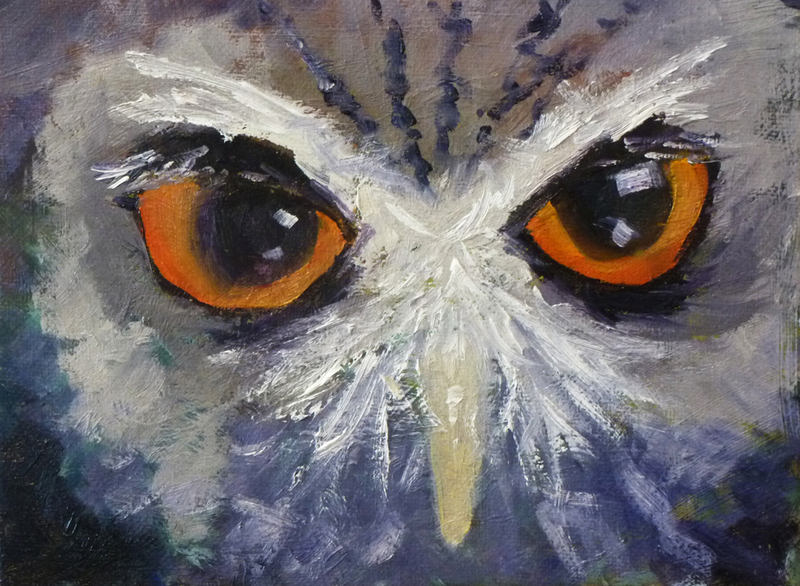 I must admit that the eyes of the owl are great fun to paint. The size, the color, the penetrating gaze and that little reflection all have captured my attention. This fellow is a recent entry into the Small Impressions Shop at Etsy. Click here to view him in the shop or make a purchase. 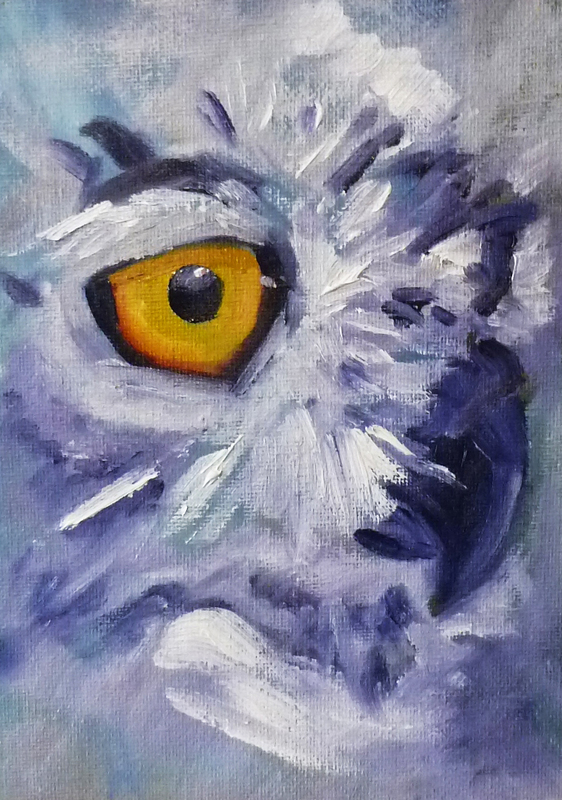 He was created on a 6x8 inch canvas panel and will keep an eye on you. 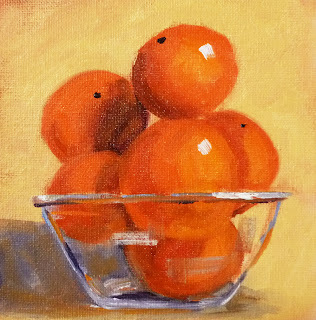 Today's painting is a simple little still life and it was a lot of fun to paint. The knobby shape and the beautiful color brought inspiration. The painting is 4x6 inches and is for sale at my Etsy Shop. Click here to view it in the shop or make a purchase. This is a little sketch that I completed in preparation for a larger painting. 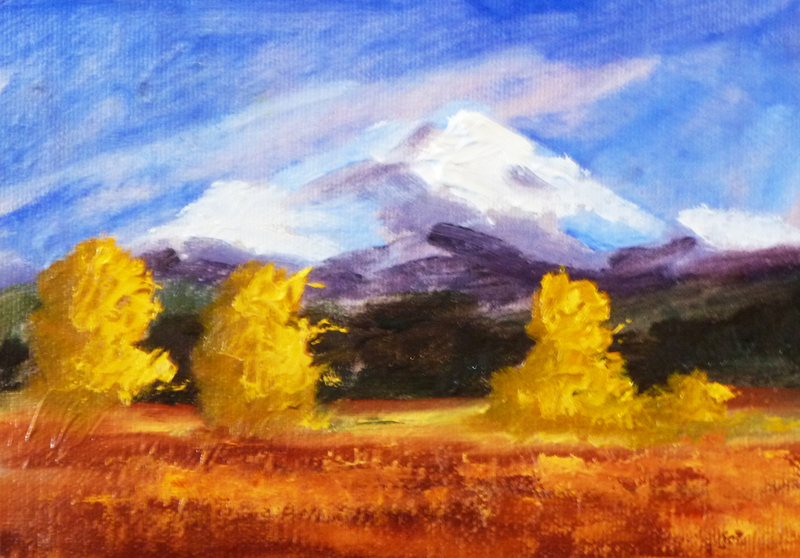 It is 4x6 inches and provided a great audition for color and design. It has been a while since I completed a landscape, so it felt good to get the juices flowing again. The larger painting is finished, so it is time to let go of this little piece. 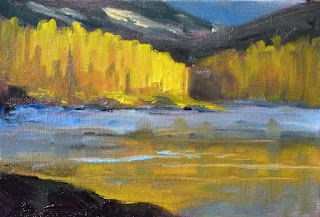 It is for sale at my Etsy Shop, Small Impressions Paintings, and can be viewed or purchased at this link. It was really fun to paint this owl. When looking into the eyes of these creatures, it isn't hard to understand why they have a reputation for being full of wisdom. Their eyes are so large and expressive; this fellow was no exception. Not only were his eyes an intriguing subject, his feathers provided a great exercise in loose brush strokes. This 5x7 inch painting can be viewed or purchased at my Etsy Shop, Small Impressions, by clicking this link. If you would like to see some of my other small paintings of birds and animals, there is a section of my shop that has more offerings. Click here to view more.